We are excited to begin our eighth season this fall and are starting the season off with a New Skater Clinic on Sunday, September 10 from 3 to 6 p.m. at Gibson’s Skating Arena. 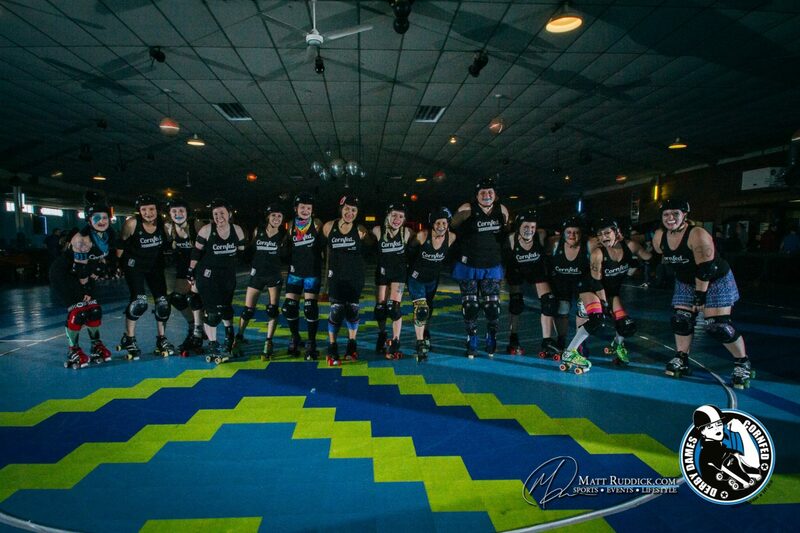 If you have ever contemplated getting involved with roller derby now is your chance! The clinic is open to anyone 18 years or older interested in playing roller derby, becoming a referee or non-skating official. No previous skating experience is necessary; our talented coaching staff will spend the clinic teaching the basic skating skills of roller derby. The following gear is required at the clinic: quad roller skates, mouth guard, helmet, elbow pads, wrist guards, and knee pads. Much of the required gear is available to borrow from Cornfed but each participant must provide their own mouth guard. The clinic is just $5 to attend and does not require any long-term league commitment. If you do choose to join the league, a three-week boot camp will follow the clinic and expand on skating skills before league practices resume in October. Pre-registration is required, to register fill out this form. If you have any additional questions about the clinic or borrowing gear email cfddrecruitment@gmail.com. Help Support the Cornfed Derby Dames! Donate Now! © 2019 Cornfed Derby Dames. From the Studio of Farmhouse Creative.